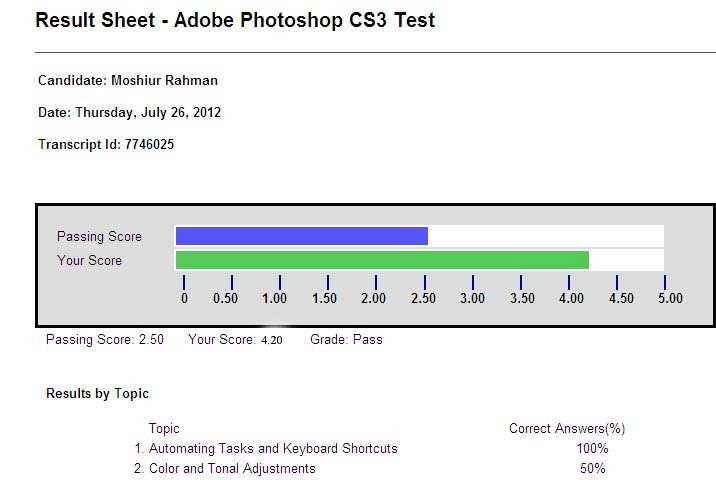 oDesk Adobe Photoshop CS3 Test Answers – " Star ডায়েরী বিডি "
State whether True or False:You cannot arrange the stacking order of the Auto slices. State whether True or False:A working space is an intermediate color space used to define and edit color in Adobe applications. State whether True or False:The Out Of Gamut option works only on RGB and Lab images. Refer to the given image.Which of the given options displays the Modal control in the Actions palette? State whether True or False:The mask created by the Replace Color command is permanent. Refer to the given image.Which of the following options displays Temporary Work Path in the Paths palette? State whether True or False:Changing units on the Info Palette automatically changes the units on Rulers. Refer to the given image.In which of the given instances, a caution icon appears next to the layer comp name as shown in the picture? Refer to the given image.Which of the given options displays left indent in the Paragraph palette? Refer to the given image.Which of the following Lock options in the Layers palette prevents modification of the layer’s pixels using the painting tools?